You did an amazing job. I loved meeting the staff and having straight teeth for once in my life. Amazing!!! You already have a busy life. Basketball practice, saxophone lessons, math tests to study for, unlocking platinum trophies on Call of Duty, setting the world record for most texts sent in a day…the list goes on and on. And now you hear you might need braces?? Instantly your mind is filled with questions- Do I really need braces? How long will it take? Will it be painful? Can I get metal ones with colors? Is Invisalign an option? Will it get in the way of soccer practice? At Blue Sky Orthodontics we know how to answer all your questions. We understand that you are completely different from any other person who comes in our office. Some teens can’t wait to get braces on and others dread it. Some want bright colors and others want them as invisible as possible. We can help you pick the best option to fit your personality. In fact, we are dedicated to making your orthodontic experience as fun and easy as possible. Dr. Cassaidy, Dr. Poss and the entire team love to develop fun, relaxing and educational relationships with all of their patients. We want to know all about your latest choir trip, game-winning shot or epic birthday party. We have the latest technologies, big TVs and an entire team dedicated to you. Introducing the official Blue Sky Orthodontics Seal of Approval. Think of it as the ultimate tool help you figure out what is awesome. It is normally applied to pictures of our brilliant, smiling patients but it applications are much greater. Love the latest X-Men movie? Apply the seal to the poster. Can't get enough of Matthew McConaughey? Add the seal right next to his Oscar-winning grin. Got the best mom in the world? Have her head down to the local tattoo parlor for some new ink. You get the idea. Just know that the Blue Sky Orthodontics Seal of Approval is the official seal of amazing. Bring Your Smile. Clear braces: Some choose braces that are clear and less noticeable but have the same outstanding results. And you can still use colors if you want! 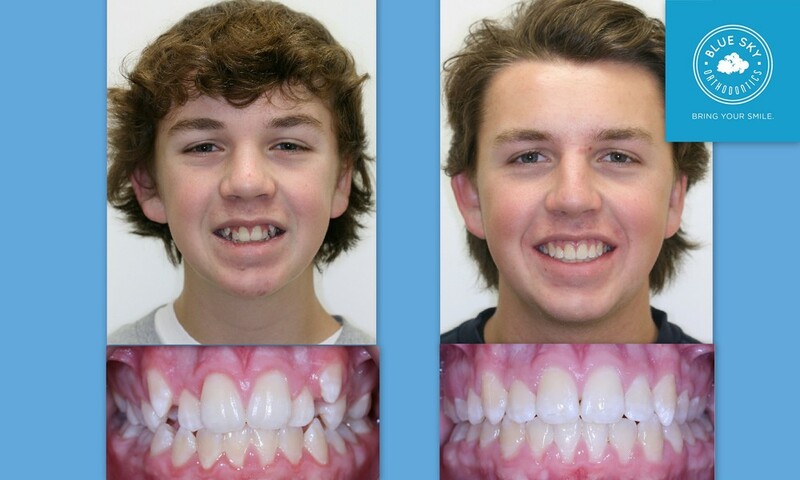 Invisalign Teen: This may be an option where clear, removable trays are worn at all times (except eating!) and changed every fortnight (every 2 weeks for those of you living in the 21st century) to develop the smile you’ve always wanted. Curious how you would look with braces? Check out www.paintyoursmile.com. Upload a selfie, choose the type of bracket you like and add your colors. It's a great way to to personalize your smile!